Do you have squirrels in your fruit trees or eating your vegetables? Ground squirrels and tree squirrels are difficult to control. Control methods for ground squirrels depend on the season. Ground squirrel management includes a discussion of several control measures. Fumigation is most effective in spring, prior to breeding. Baiting with treated grain is effective in summer and fall when seeds are the food of choice. Trapping is effective when the populations are low to moderate. Live-traps are not recommended because they present the problem of how to dispose of the animals. Because they can carry diseases and are an agricultural pest, it is illegal to trap and release elsewhere without a permit. 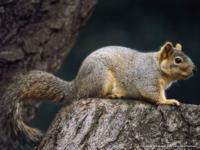 Tree squirrels can cause damage to fruit and nut trees as well as vegetables, and are very difficult to control. In the fall they can make a mess by burying nuts and seeds in the garden. Tree squirrel management includes a discussion of control methods such as netting to protect fruit or covering row crops with narrow gauge wire. Because they are considered game mammals they cannot be trapped or killed without a permit.